would I be able to take .16, divide it by 30 then multiply it by 20 to get the solubility in 20 degrees, or would that not work? google doesn't seem to give me the solubility in 20 degrees. The solubility of Zinc Chloride in water at 20°C is 395g/100g. 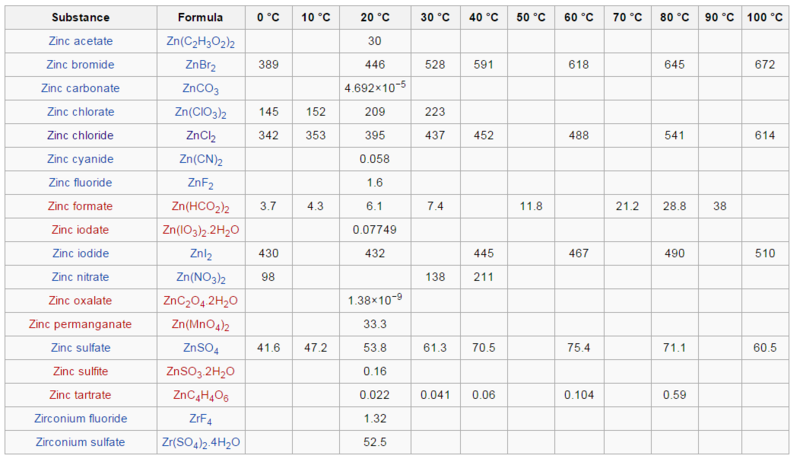 The table below shows the solubility (g/100g) of zinc compounds at different tempearates. Why does solubility of solids sometimes decrease with temperature increase? Why does the solubility of some salts decrease with temperature? Whose solubility increases with increase in temperature? Solubility of oxygen in water with temperature, why does the change in solubility decrease around 40 °C? Why gas solubility decreases with temperature?